‘Research by the UN estimates that 8.4 million people in the UK are food insecure’, states Laura Hopper, CEO of food waste charity Plan Zheroes. A term defined by the UN as the state of being without reliable access to sufficient quantity of affordable, nutritious food, ‘food insecurity’ is a serious issue affecting unknown masses across this country, as there is currently no official measure for food insecurity in the UK. According to the UN, however, approximately 4.7 million people across England, Scotland, Wales and Northern Ireland are experiencing real hunger, being labelled ‘severely food insecure’. ‘At the same time as people are struggling to afford to eat’, Laura continues, ‘we have a situation where UK food businesses waste 3 million tonnes of food per year’. Recent attention around food waste and its negative impact on the environment has meant that more businesses are taking steps to reduce waste. However, such figures therefore also beg the question: what magic could happen if people worked together to get our surplus food where it is really needed? Enter Plan Zheroes. A small charity based in London, Plan Zheroes work tirelessly to tackle both food poverty and food waste. Using an online donation platform as well as volunteer-led collections, they facilitate the redistribution of good quality surplus food by taking it from businesses and giving it to the charities and community groups supporting people who are struggling to afford to eat. For many like Alexander Brown, Director of the Soup Kitchen at the American International Church, Plan Zheroes are a ‘lifeline’ in access to free, fresh food. And we wanted to help them out. On 30th October 2018, we partnered with Plan Zheroes to host our third annual mammoth charity mission called ‘Wok for 1000’. Each year, with over 180 volunteers in tow, we gather in London’s iconic Borough Market to attempt to transform donated food supplies into over 1000 tasty meals for those most in need across the capital. This year was no exception: beginning bright and early on the brisk October morning with a speech from School of Wok’s founder and CEO, Jeremy Pang, our wokstar volunteers got to whip out their woks - first tackling chicken Massaman and vegetable green curries, before moving on to fried wontons and Hong Kong noodles. Joined by friends old and new, including staff from one of our key food donors, SeeWoo, the atmosphere at the event was utterly electric (especially with Team Keytree and their bellowing chants being egged on by an excited Jeremy). 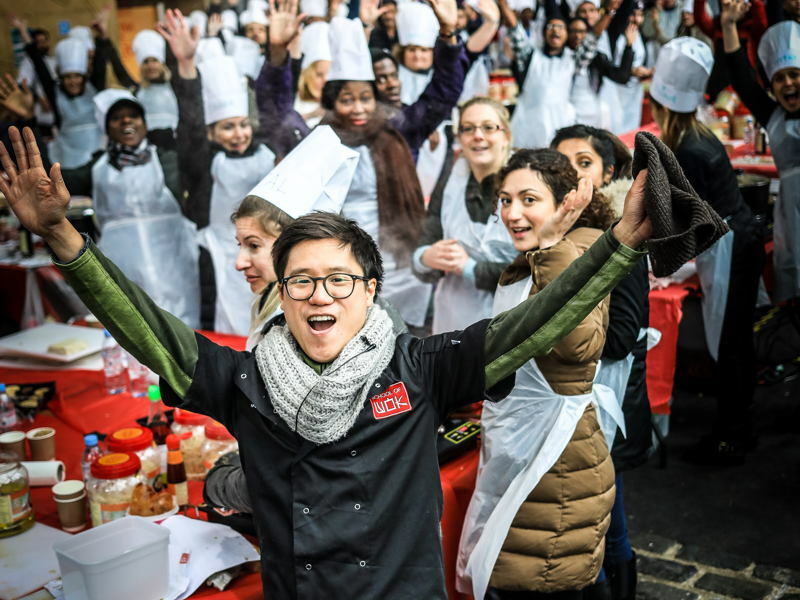 And it was also a roaring success: not only did we raise over £7500 for Plan Zheroes, but in just 4 hours, our teams created a staggering 700 litres of curry, 1200 portions of noodles and 6000 (yes, 6000) wontons. While our tuckered-out volunteers got to tuck into some of their creations, we were lucky enough to end the day assisting Plan Zheroes in delivering the food to 10 different charities across London. Getting to meet the people who benefit most from Wok for 1000 was an absolute highlight, and proved to us exactly how much a simple, tasty, fresh meal can mean. We are just one company, making one step towards eradicating food waste and food insecurity across London. Imagine what could be achieved if the whole of our capital’s community pulled together?